Sleep Apnea is a condition which affects millions of people each year yet often goes undiagnosed. This condition has the potential to greatly disrupt natural sleep cycles. Using comfortable mattresses, natural sleep aids, and calming bedtime routines are all powerful ways to promote health sleep—but few are capable of addressing sleep apnea symptoms. Knowing how to identify and address this condition can help ensure you’re getting the best rest possible. So what is it? Well, in Greek, the word ‘apnea’ means ‘without breath’, which makes sense because sleep apnea is a potentially dangerous condition in which the sufferers throat constricts during the night interrupting the regular breathing pattern. The resultant drop in oxygen intake panics the brain into shocking the body awake. This can happen tens or even hundreds of times a night. The most troubling part is that many sufferers don’t even know it is happening. Research indicates only one in four sufferers are aware they have the condition. Scary stats! Numerous treatments exist for sleep apnea, one of the most common is to wear an uncomfortable breathing device through the night. Think Darth Vader (or Kylo Ren) and you get the idea. Fortunately there are a number of natural treatments for the condition and a well balanced diet is top of the list. There are a myriad of causes for sleep apnea, anything from being born with an oversized tongue or a deviated septum, to allergies or sinus problems. That said, there is one variable that in adults is more likely to lead to the condition than any other. That is weight. Or to be exact – an excess of weight. Being overweight or obese greatly increases the likelihood an individual may suffer from breathing problems such as sleep apnea. Individuals who are obese are four times more likely to suffer from the condition than those who are a normal weight. When we pile on the pounds we don’t just expand around our waist we grow in a variety of places. The bad news is when we start to expand the fat deposits around our airwaves. At night when our throat and tongue muscles relax the excess soft tissue can constrict our airway, the result is sleep apnea. One quick rule of thumb to remember is if you a man with a collar size over 17 inch or a woman with one over 15 inches then you have a greater risk of developing sleep apnea. Eating healthy whole foods helps support natural respiratory function in many cases. 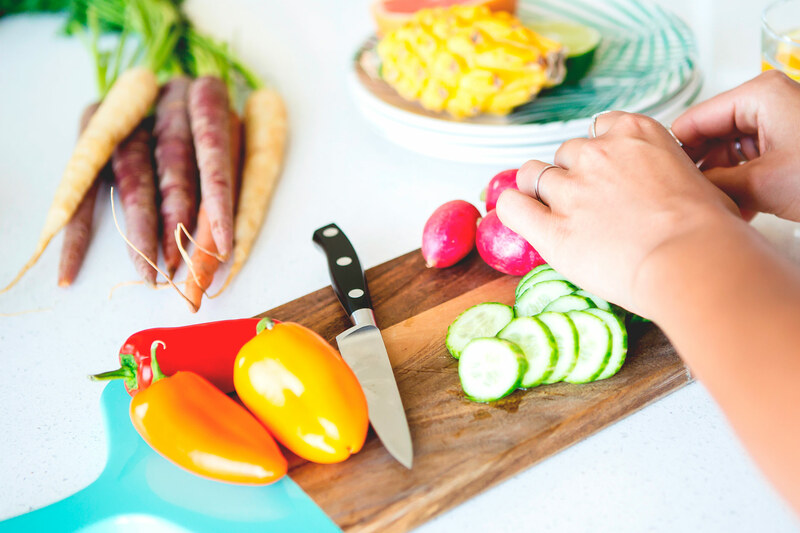 In tandem with regular exercise, a healthy well-balanced diet can be essential in helping to maintain the kind of healthy weight that can help reduce or stop the symptoms sleep apnea. A diet heavy in fruit and vegetables, such as a Mediterranean style diet, is preferable to the typical high calorie American carb-fest. Fruits and vegetables that are high in fibre play a very important role in helping you to maintain a healthy weight. Fibre promotes fullness. Meaning you can eat less but feel just as satisfied. Try to increasing the frequency items such as broccoli, cabbage, brussel sprouts and sweet potato appear in your diet. Replace calorie dense snack food like candy and chips with healthy but tasty alternative likes raspberries, apples and rice crackers. Normally bananas are a great addition to any diet but in this case they can lead to increased mucus production which isn’t great for sufferers of respiratory conditions. So maybe, just this once it’s best to cut back on the curvy yellow delights, especially in the evening time. While we may have been conditioned by television to believe a nice glass or three of wine on the couch at night is the best possible pre-bed routine, in truth the opposite is true. While it can help us nod off initially, alcohol puts in motion a whole host of bodily processes that contribute to broken sleep. What’s worse for sleep apnea sufferers is that alcohol is a relaxant, which is of course one of the reasons we like it so much. However, when one of the things it relaxes are the muscles in our throat and palate that we required to keep our airways open it’s bad news. Additionally, alcohol is also thought to lead to an increase in inflammation and fluid retention, which again is bad news if it affects the respiratory system. As part of a balanced diet it’s wise to maintain a healthy relationship to alcohol. This means thinking about how much we drink and especially when we drink it. Avoiding alcohol in the two or three hours before bed will play a role in reducing the symptoms of apnea. Not everyone with sleep apnea is overweight and not everyone overweight will suffer sleep apnea. But there is a strong and proven link between the two. Maintaining a healthy weight will decrease the chances of developing the condition and in existing sufferers losing weight can lead to much improved symptoms. A well-balanced diet, in tandem with regular exercise, is essential to maintaining a healthy weight. Especially as we get older and our metabolism begins to slow.